For those who don’t know, the International Mission Board, which is the missions sending agency of the Southern Baptist Convention, recently announced a serious shortfall in their approximately $300 million annual operating budget. 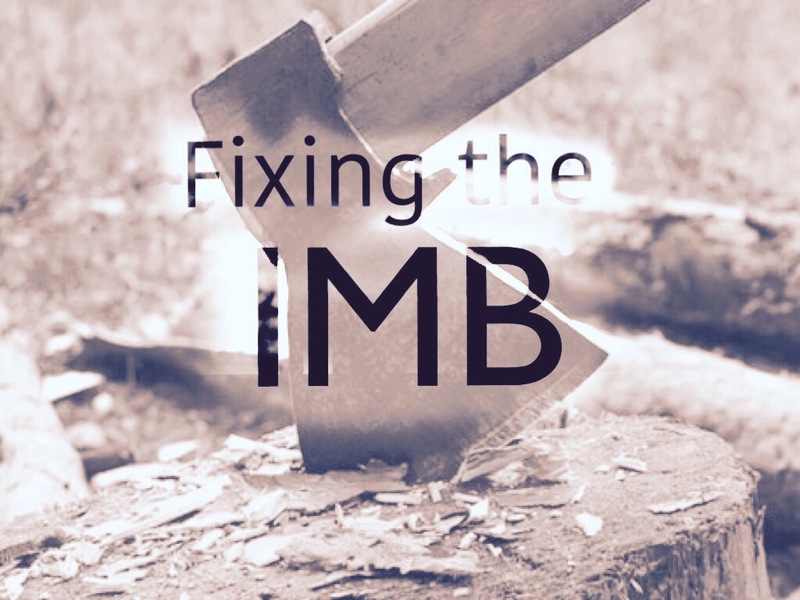 Over the last six years, the IMB has spent $210 million more than they have received in contributions. As a result of this shortfall, they have said that between 600 and 800 missionaries will have to be brought home. I have read a good bit from Southern Baptists either criticizing or defending the IMB and its trustees for their management of this financial crisis. Some say that Southern Baptist churches could give much more to missions. This is very true. Not surprisingly, a large percentage of the giving to the IMB is shouldered by a fraction of the churches in the SBC. But others have insisted just as strenuously that there is no excuse for such overspending. They say that churches should not be asked to fix this problem by giving more money. Well, I sympathize with both sides. I agree that Southern Baptist churches could do much more for missions than they do. But I also admit that if I was a Southern Baptist pastor, I’d give less to the IMB. For the record, I’m a fully-supported missionary whose support does not come from Southern Baptist churches. So how much they give and to whom does not immediately affect me. And of course I am not under the impression that anyone at the IMB wants or needs my help. But as someone who cares about the mission, it’s hard to not have an opinion about what’s happening at the IMB. Their current crisis is one with lessons for other, smaller agencies. So lots of people are upset about the financial management: how could they overspend so badly? But I want to argue that there is a better reason to be disenchanted with the IMB. The greatest problem is not in how much money they spent, but what they spent the money on. Now, the money was not mismanaged in the sense that there was a lot of money spent that was totally disconnected from their goals. Something like 80% of their budget is spent on personnel salaries alone. From all I can tell, the IMB’s budget is representative of their values and their thinking about missions. But that is precisely where there is real cause for concern. And in that sense alone would I say they have mismanaged missions money. Many of the things they spent it on were simply not missions. There is no excuse for doing so little missions with so much missions money. Lest you think I’m a lone voice of protest, listen to what Paige Patterson, president at Southwestern Baptist Theological Seminary, said four months before the shortfall announcement came from the IMB: “Unfortunately, we’ve got about 750 [IMB missionaries] that need to be brought home…” Patterson here is talking about missionaries that are employing methodologies that he strongly believes to be deceptive and unbiblical. I encourage you to go read this report in full here. Now, I don’t know enough missionaries with the IMB to make any judgments about how many there are who are employing the sorts of strategies that Patterson is talking about. But I have friends serving in fields around the world and we are in a good position to observe the IMB’s strategies at work. And Patterson’s number is very believable. As we have heard, the IMB spends such a significant portion on missionary salaries, there is really only one way out of this crisis: pulling missionaries off the field. Fortunately, there are plenty of missionaries that can be brought home with no effect other than to make the IMB a healthier missions agency. So here is one criterion that would now (and likely forever) solve the IMB’s financial problems: cut all non-church-planters. Really, ALL. Meaning, withdraw 100% of field personnel that is not actively engaged in planting new churches. Let’s break all IMB missionaries into three sorts: Church-planter A’s, Church-planter B’s, and the Others. Church-planter A’s have planted one or more churches. Church-planter B’s have it in their job description to plant a church, but have not planted a church (though they may have been on the field a decade or more). The Others (not the ones from Lost) do not have it in their job description to plant churches. So here’s the plan: cut all the B’s (who, say, have been on the field longer than ten years) and all the Others. Why cut the B’s? If you are supposed to plant churches and have not planted one after ten years, there are only a couple possible reasons for it, none of which are acceptable. You likely have espoused some silly strategy about waiting for churches to appear almost spontaneously. Meanwhile, there are other guys on the IMB (the church-planter A’s) that have worked hard to preach the gospel, make disciples, prepare sermons, invite people to come to church meetings, train believers for ministry, and travel until they find a place where people will respond to the gospel. Come on, you say, how many B’s can there really be at the IMB? I don’t pretend to know. But I know of enough to be sure that it would be a big first step towards balancing the budget. If the average Southern Baptist pastor had a chance to observe many of these church-planter B’s, I have little doubt that his giving to the Cooperative Program would decrease. Why cut the Others? I wouldn’t deny that there may be great good done by the others. But if you’re having a financial meltdown and you’re a mission agency, maybe you should only do the core mission work for a while. I would suggest that the researchers, translators, teachers, entrepreneurs, and various specialists that make up part of the IMB mission force be asked to go raise their support from other places. If their work is so important, they should have no trouble convincing churches to partner with them. I love the idea of cooperative missions giving: it in theory allows missionaries to get to the field quickly! So why not keep the missions money separate from the Other money? Again, core Pauline, Great Commission, church-planting endeavors belong in a category all to themselves. Get rid of the other stuff, and you’ll have plenty of money for Church-planter A’s. There is another kind of missionary that should be cut from the IMB. Let’s call them Church-planter X’s. These men have it in their job description to start churches, or rather church-planting movements. Usually they are in the B category because they end up planting zero churches. Occasionally one of them reports the planting of 1,000 churches. These are some of the missionaries that Paige Patterson is complaining about. It’s hard to imagine the IMB cutting these guys, though, because they almost certainly represent the majority of the churches they report being planted each year through the IMB’s global efforts (13,000+ in 2013). But planting make-believe churches is not really any better than planting zero churches. Once again, some clearer reporting would be nice. How many IMB missionaries have planted zero churches in the last ten years? Where are those 13,000 churches that were planted in 2013? Do they still exist in 2015? Can we go see them? Who is pastoring them? 13,000 Southern Baptists? Somehow, business as missions (in various forms) is being touted as one of the main solutions to the IMB’s woes! I would encourage anyone interested to actually track down a few dozen guys working the business as missions model and actually ask them how it’s going. Are they planting churches and making disciples? ‘Business as missions’ missionaries may cost less than a traditional church-planting missionary (though they often cost far more) but we might want to find out what they actually accomplish on the field. Spoiler alert: not much. These cuts would have an additional benefit besides streamlining the budget. I think that if the IMB could tell Southern Baptist churches that they were now a purely church-planting agency, and that every dime that went to the field went to real church-planting missionaries, I think they would start to see missions giving increase. I daresay that no Southern Baptist pastor could account for the activities of even a fraction of the IMB missionaries. The result is an agency that is out of step with what its denomination stands for at home. That’s a shame. I serve in North Africa and have known four IMB missionaries in the last two weeks. They have a combined experiences of almost 50 years on this field. They have planted a total of 0 churches. One of them who has been here for 20 years told me that after all of that time on the field he has seen none saved or baptized. I know this is a hard field but there may be a reason that fruitlessness is the rule rather than the exception. I am not a missionary. I am a sender and support several missionaries; however, I am concerned about the IMB missionaries. Your proposed initiatives regarding church-planters are positive and should be given prayerful consideration. I am praying.